The cross-hatched areas would be the footprint of the new structure. 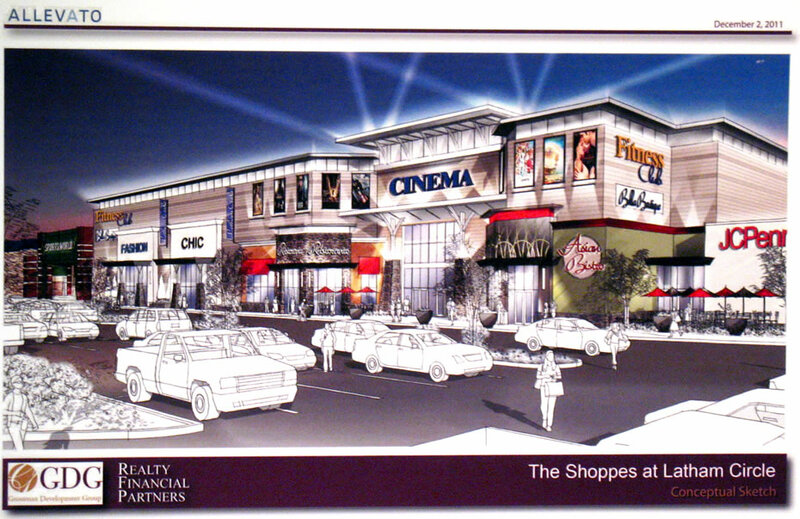 A conceptual sketch of the "Shoppes at Latham Circle." The Latham Circle Mall has already lived a few lifetimes. It was built in 1957 as an open air mall, and then converted to an indoor mall two decades later. Today, well, it's more or less dead. But reincarnation may be just ahead. 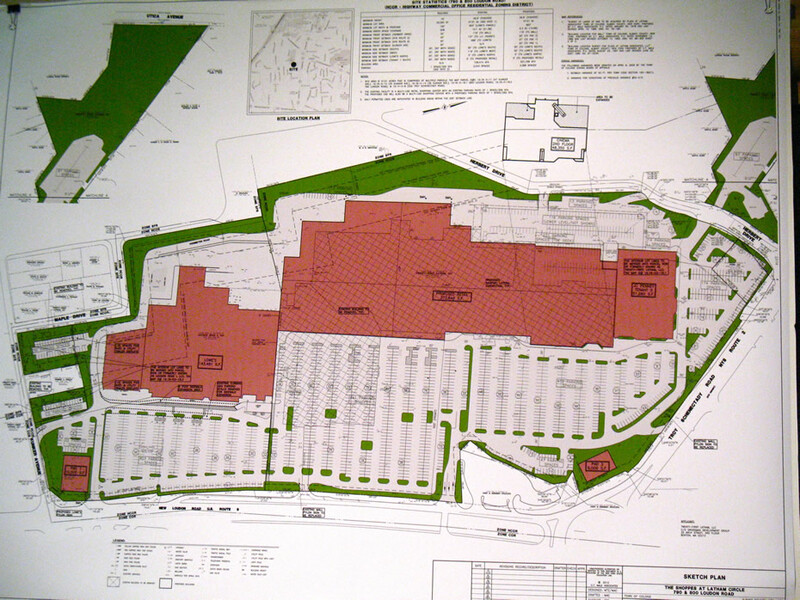 A development group is proposing to demolish a large part of the Latham Circle Mall and build again as the "The Shoppes at Latham Circle" -- with retail, restaurants, entertainment and -- gasp -- maybe a supermarket. 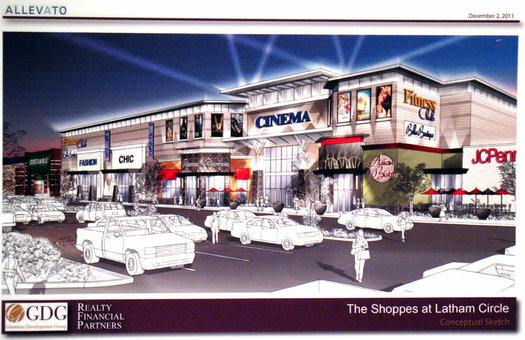 There are large format photos of the proposed plan, and a rendering, above. Scroll all the way up. + Demolish a large section of the existing buildings -- basically the whole middle of the mall. Lowe's, JC Penney, and the Regal cinema would remain. + Replace the demolished section with 372,000 square feet of retail space, which would be about 100,000 square feet less than the current mall. Outlying "pad" sites of 6,000 square feet and 10,000 square feet would also be added. + Demolition would be finished by the end of 2012, construction would start in early 2013, and tenants would be later that year. The company hasn't shared a cost estimate. + This new space would potentially include 2-6 tenants. + Grossman VP Mark Hebert says the company doesn't have any leases signed with new tenants -- but it does have two letters of intent from national-level potential tenants. "We've made a good amount of progress with tenants we think will be difference makers." Of course, they can't share the names of these potential tenants. + Hebert says the vision for the new development is multi-use -- restaurants, grocery, retail, entertainment -- a group of tenants that would attract a broad crowd of people throughout the week and each day. 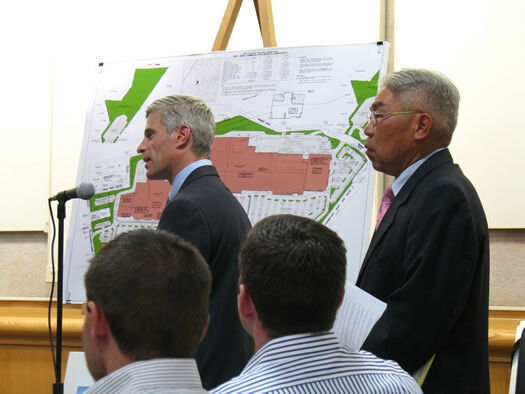 He points to a development he was involved with near Boston -- Legacy Place in Dedham, Massachusetts -- as an example. + In addition to the two potential tenants who have signed letters of intent, Donald Zee -- an attorney for Grossman -- says the developer also has strong interest from a national family entertainment restaurant chain based in Texas that doesn't currently have a restaurant here. He says the chain has been up to see the site and will be pitching it to is real estate committee (apparently a sign of serious interest). In the presentation to the Colonie planning board, Hebert said the mall has "suffered the consequences of being stigmatized" as a failed development. And Zee added: "Because this site is on the Dead Malls (website), retailers are coming to us and saying why should we come here?" Zee said Grossman has tried to persuade companies to the look at the site again because its central location in this area -- the "crosshairs" of the town. One of the interesting -- if not surprising -- things about Grossman's presentation was the central role of cars and parking. The new version of the site would include 339 new parking spaces, which Zee says a potential tenant requested. He pointed out that national retailers generally seek 5.5 parking spaces per 1,000 square feet of retail space. "We could probably use another 100-200 parking spaces." The car focus also extends to how people get in and out of the parking lot. Zee mentioned that potential tenants were unsure about the somewhat unusual entrances and exits to the LCM lot. And when the possibility was floated during initial discussion of reducing the number of "curb cuts" connecting the lot to surrounding roads, one of the potential tenants called the reduction a "deal killer." So, a supermarket? Is it a Wegmans? Yep, you've no doubt heard the rumors about Wegmans and the Latham Circle Mall site. They've circulated everywhere. Hebert says a supermarket would be part of an ideal mix at the site because of the weekly visits generated by such a store. And there's a "continuing dialog on that front." So we asked Hebert if the chain that's part of this dialog is already in New York. Yes. Is it already in upstate New York? Yes. Is it in the Rochester area? Hebert said he couldn't be specific. The planning board presentation Tuesday night was a preliminary presentation -- basically just a way to publicly introduce the idea to the board. There are more steps before the project can move forward -- Grossman and the planning board will have to negotiate a bunch of details. But board members were enthusiastic in their comments about the project. And the developer says it's looking to move quickly because one of the advantages of the Latham Circle Mall is that -- because of its current state -- new tenants could be in place by next year. Wegmans as an anchor store would amazing and absolutely generate the traffic to keep it from becoming a Dead Mall again. That conceptual sketch could also use some rainbows and LOLcats. Great post! Wish I could share more of the info i've been given. Very exciting news for the area though. now to wait until they officially announce the tenants. "a national family entertainment restaurant chain based in Texas that doesn't currently have a restaurant here." Sounds like Dave & Busters to me. Promises, promises... Every few years someone comes up with a grand plan to do something with that parcel, gets everyone's hopes up, and then it slowly fades away. Remember when they promised a Bonefish Grill was coming? I'll believe it when the bulldozers start knocking down that dried up empty husk of a mall. Mmmm...a national family entertainment restaurant chain. I've always wanted more of those. Is there a local group I can join so we can band together and lure another one to our area? It would be nice to see the mall get an extreme makeover. I love the conceptual drawing. The mall is in color like Oz while the cars and people are stuck in an A-ha video. I already hate it because they have added an unnecessary "pe" to the word shop. STOP! It doesn't make you fancy. @kriskaten, I totally agree with you. Apparently someone decided that "Shoppes" is more upscale. I have the same reaction when I read something about "Olde [sic] Delmar." Blech. I think developers have run out of names for retail centers... no creativity whatsoever. In Glenmont, they took things to a new level when they named the Price Chopper plaza, "The Shoppes at Town Squire" - yes "squire" not "square" - what were they thinking? I live near the mall and it is upsetting to see how derelict the mall has become. I know that propositions have been made to remodel the mall for the past 10 years. The mall is a complete wasteland, it needs to be remodeled. JC Penny, Regal Cinemas, and Lowe's are the only stores keeping it together. I really hope that this plan comes through and hopefully it moves along quickly. If this plan is approved, I hope that we don't have to wait long for this to happen. Wegman's would be wonderful. My son lives in Fairport, just east of Rochester. One of our "must do's " when we visit my son and his family is to go to Wegman's. It is the best supermarket ever! Just when you thought the Latham Planning Board couldn't disappoint you any more. The anticipation of which chain grocery/restaurant/stores makes me want to throw up. Is it open yet...that's the question...this area is dry bring it some life please.